The story the data tells is simple: every negative demographic trend that can hit Illinois has done so – and more so than in most other states. Illinois is not simply losing people because it’s part of the Midwest. Other states that make up the Rust Belt have not shared in Illinois’ clear demographic decline. They are still growing on an absolute, percentage and per capita basis. Illinois is not. Net natural increase in population: The number of annual births in the state minus the number of annual deaths. 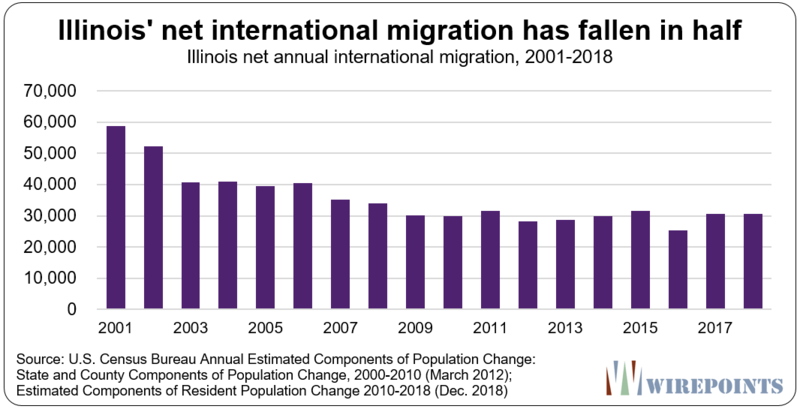 Net international migration: The annual number of international immigrants moving to Illinois minus the number of Illinoisans moving to a foreign country. 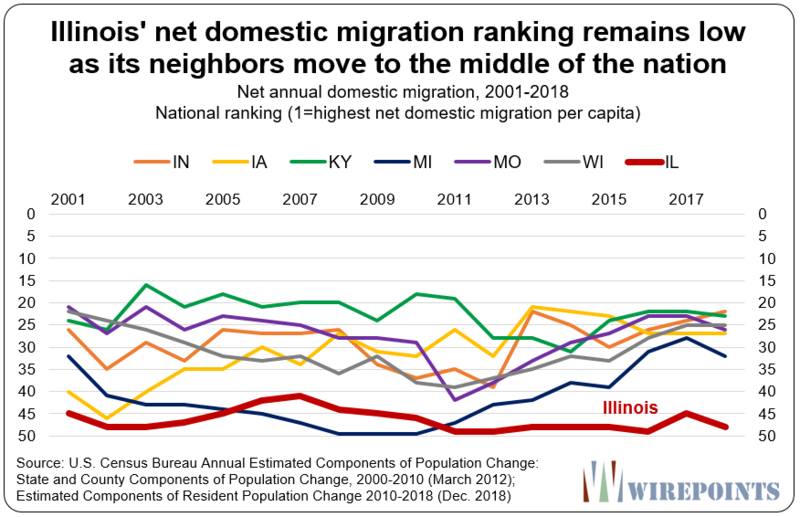 Net domestic migration: The annual number of Americans moving to Illinois from another state minus the number of Illinoisans moving out of Illinois to another state. 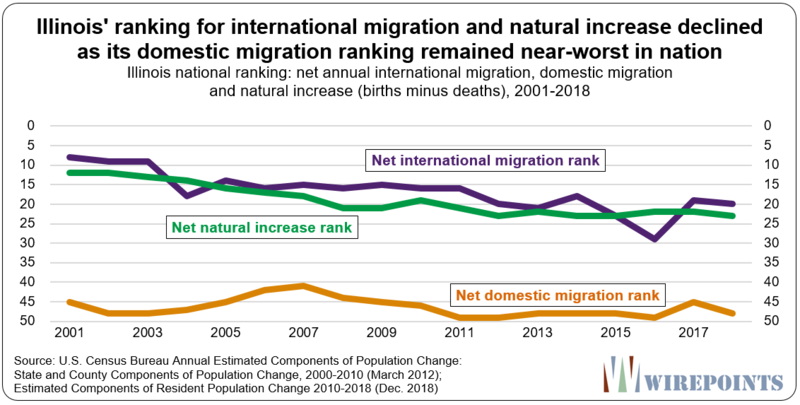 Net change in population: Annual gain/loss of total population after combining the results of a state’s natural increase, international migration and domestic migration. Per 1,000 population national ranking: 50-state ranking of the demographics listed above. The annual change is divided by the population of the state in that year. Ranking goes from high to low (1=highest growth to 50=lowest growth). At the turn of the century, Illinois’ net natural increase in population, the difference between births and deaths, was one of the best in the country – ranked 12th-best in the nation (per 1,000 in population). Illinois’ natural increase added a net 80,000 new Illinoisans to the state’s population in 2001. That contribution, however, fell by a third between 2009 and 2013 and continued to decline over subsequent years. By 2018, Illinois’ net natural increase contributed less than 40,000 people to Illinois’ total population, a 52 percent decline compared to 2001. Illinois’ national ranking for natural increase fell to 23rd in the nation that year. The big driver in that collapse was a fall in births. 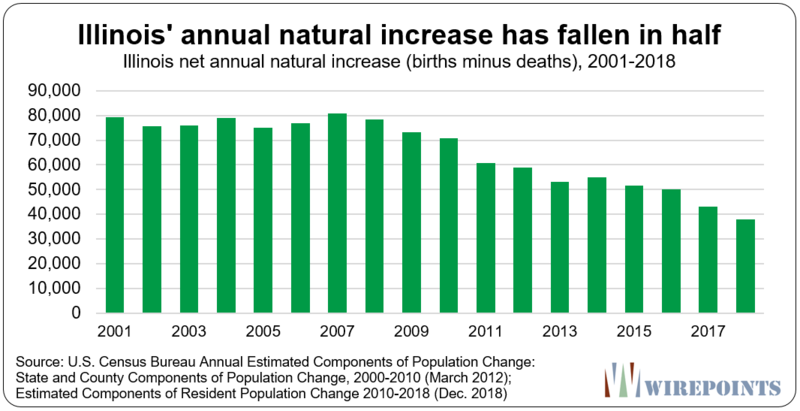 Deaths remained fairly constant over the period analyzed (about 105,000 annually, see Appendix A), but annual births have dropped from over 185,000 in 2001 to 148,000 in 2018. That’s a drop of over 37,000 births, or 20 percent, since 2001. 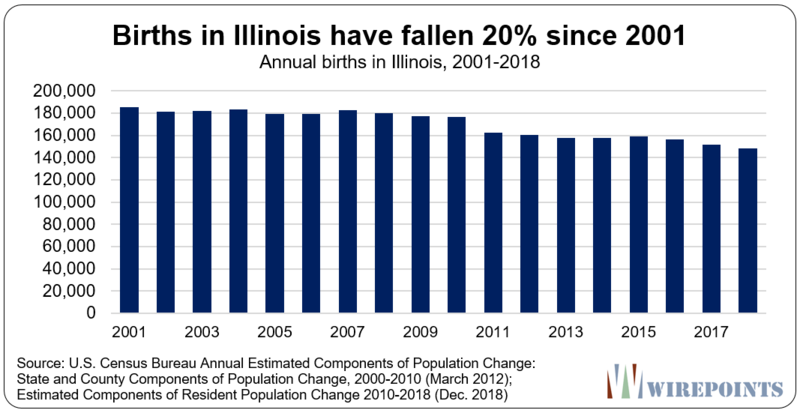 It’s true that births have declined nationally, but Illinois has been more deeply affected by that decline than other states. By 2018, the state’s births per-1,000-residents ranking had fallen to 30th in the nation, from 12th in 2001. More analysis into Illinois’ particular drop in births is needed, but one clue to the decline is the flight of millennials. 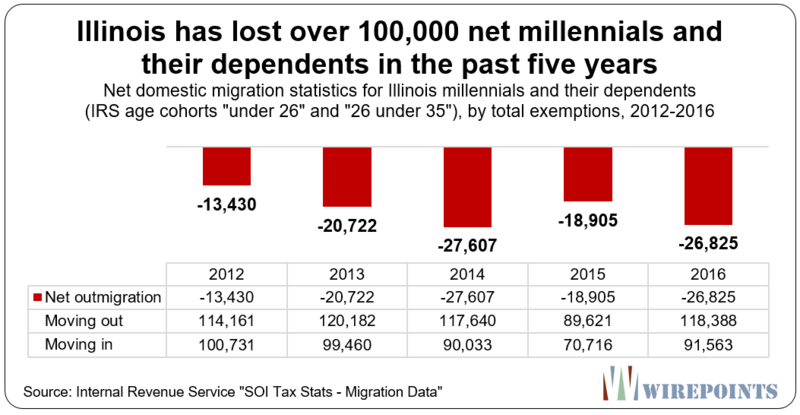 Illinois has lost a net of 107,000 millennials and their dependents to other states since 2012, according to data from the Internal Revenue Service. And a Brookings Institution report found Illinois and West Virginia were the only two states in the nation to lose millennials between 2010 and 2015. Illinois will struggle to grow its population while it’s losing its younger generation. Illinois’ rate of international immigration has also fallen. It, like the state’s natural increase, dropped by half over the 2001-2018 period. In 2001, Illinois had a net international migration gain of nearly 60,000 people. That year, the state ranked 8th nationally in the net number of foreigners, per 1,000 residents, entering the state. But by 2018, the number of net immigrants coming into Illinois that year had fallen in half, to just 31,000, and the state’s rank had fallen to 20th. For sure, international immigration fell across the entire country over the time period, but Illinois’ falling ranking shows the state was more impacted than the rest of the nation. The overall rate of immigration to the U.S. was down 17 percent compared to 2001, falling to just over 975,000 people in 2018 from 1.17 million in 2001. In Illinois, it was down nearly 50 percent (60,000 to 31,000 net immigrants). 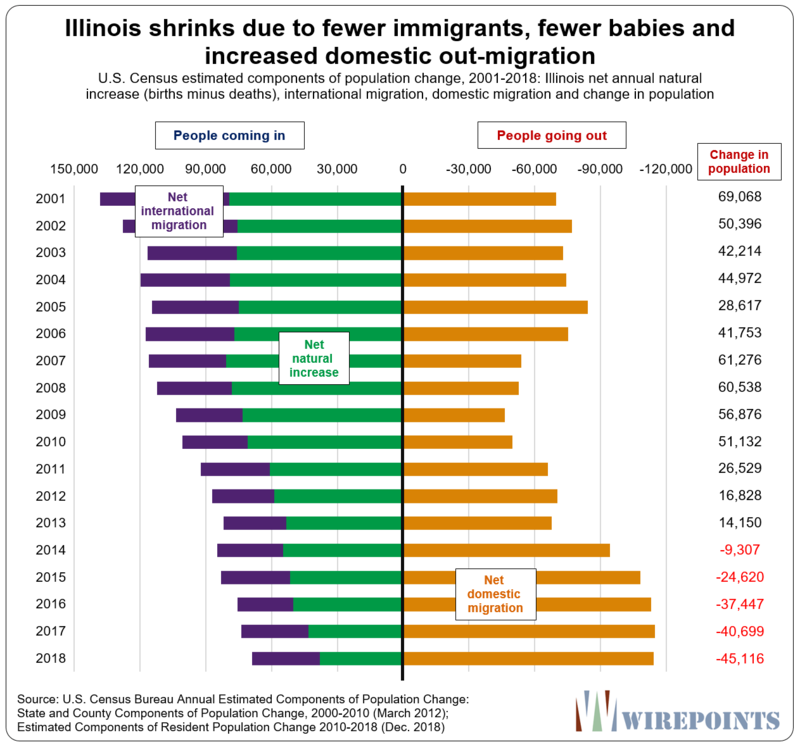 An acceleration in out-migration during the last decade has contributed the most to Illinois’ population loss. In 2009, Illinois lost a net 48,000 residents, or 5.6 people for every 1,000 residents, to other states. By 2018, the net loss had increased to 114,000 residents a year, or more than 9 people for every 1,000 residents. 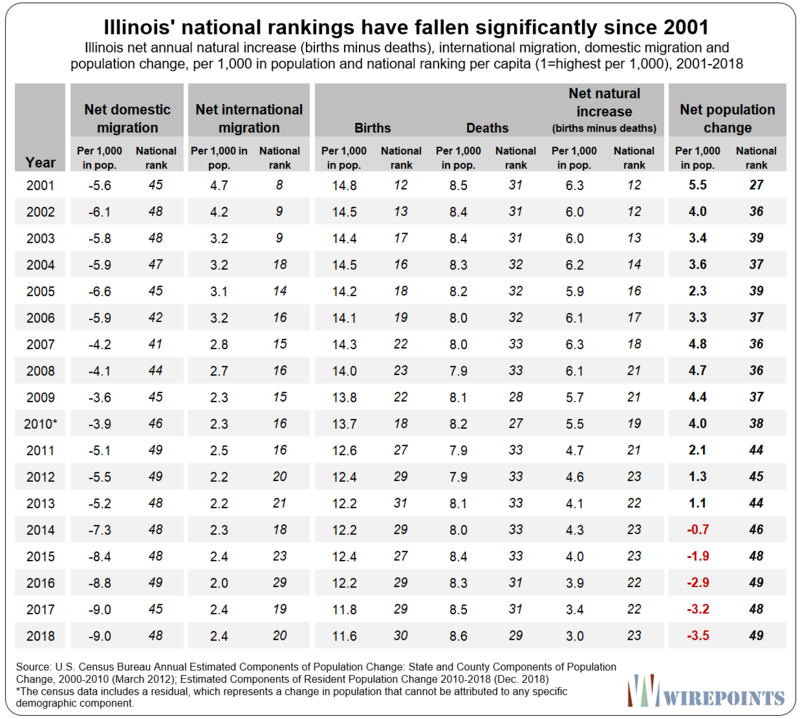 That growing loss of people isn’t reflected in a fall of Illinois’ per capita ranking because the state has consistently ranked near the bottom nationally. But the scale of the problem has grown. 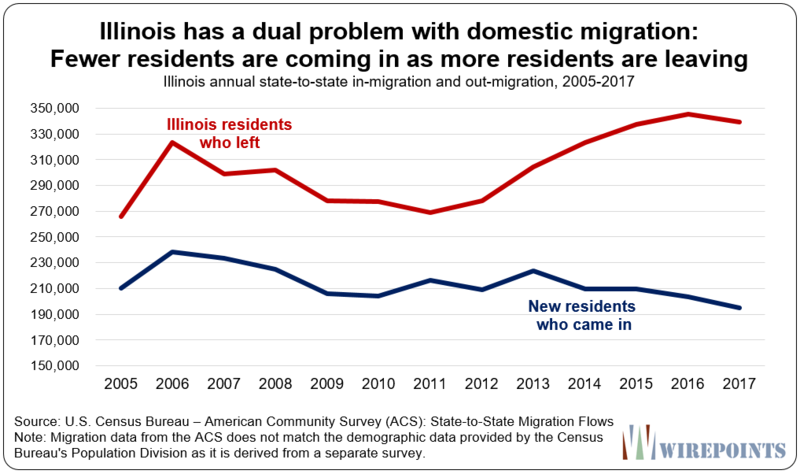 States experiencing out-migration, Illinois included, are seeing more people leave than ever before. 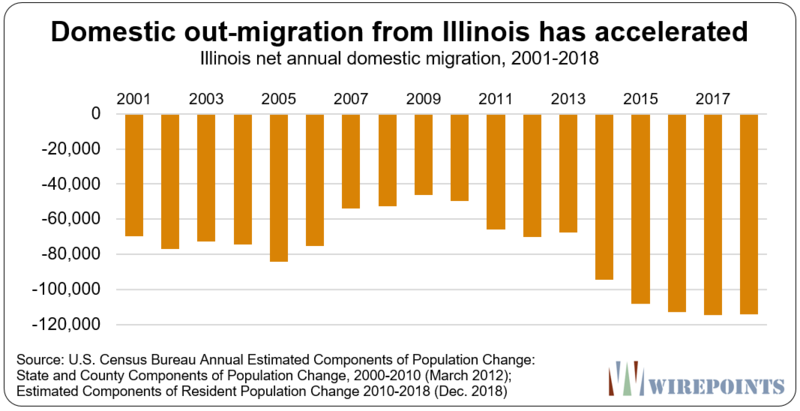 In total, Illinois lost a net of more than 1.4 million residents from 2001 through 2018 to domestic out-migration. That’s 11.2 percent of Illinois’ 2001 population. Only New York fared worse over the 17-year period. Meanwhile, Illinois’ closest neighbors experienced much smaller losses. 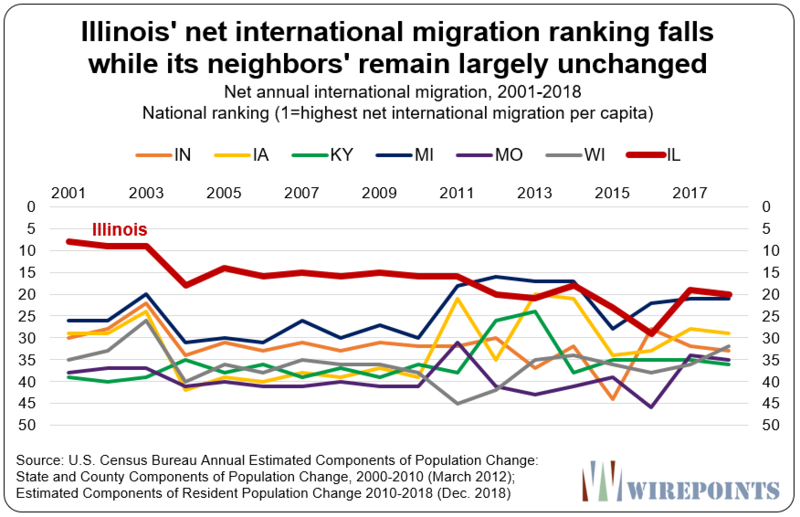 Wisconsin, Indiana and Missouri all had net out-migration worth less than 2 percent of their 2001 population. Iowa lost 2.4 percent. Michigan, which suffered the nation’s worst rates of domestic out-migration during the Great Recession, lost 8.3 percent. Kentucky actually gained people from migration over the period: about 70,000 people, or 1.7 percent of its 2001 population. However, looking at net domestic migration only tells part of the story. The migration equation is made up of two parts: current residents leaving and new residents coming in. The problem for Illinois is that both parts have gotten worse. According to U.S. Census American Community Survey data, more Illinoisans are leaving the state at the same time that fewer Americans from other states are coming in. The percentage of residents leaving Illinois jumped 28 percent between 2005 and 2017, to 340,000 from 266,000. At the same time, the number of people moving into the state shrank a total of 7 percent, to 195,000 from 210,000. Not only is Illinois driving more residents away, it’s attracting fewer residents than it once was. Add up all of Illinois’ demographic data and the trend becomes obvious. 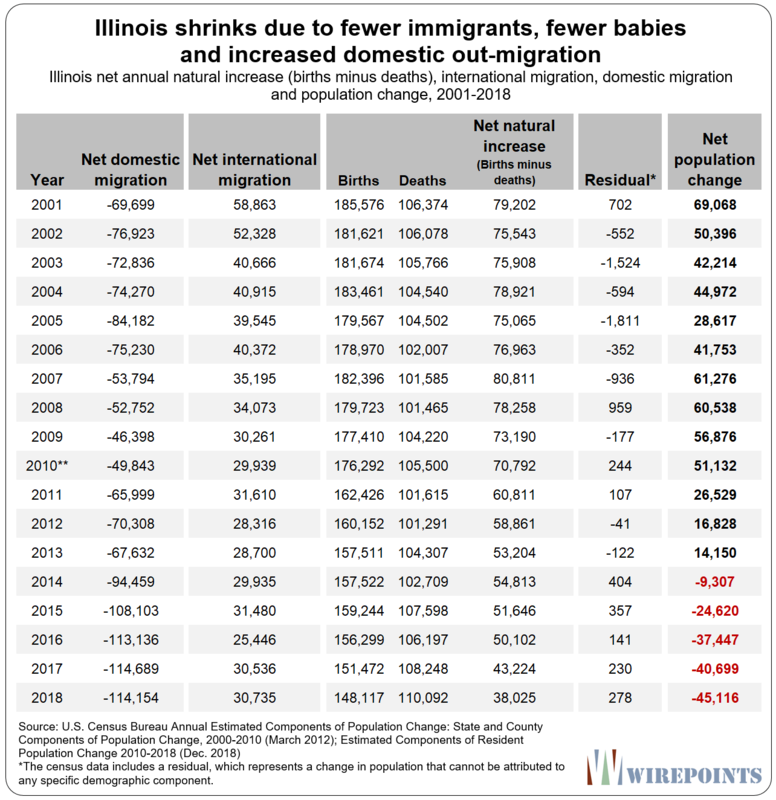 Falling immigration totals, a drop in the natural increase (births minus deaths) and an increased flight from Illinois have led to a shrinkage in the population for five years running. Illinois’ decline is clearly captured in its per capita rankings nationally. While Illinois has consistently ranked among the worst in the nation for domestic migration, the state’s natural increase and international migration rankings have also worsened significantly between 2001 and 2018. Illinois’ population grew, on average, by 50,000 people a year between 2001 and 2009. Growth began to decline steadily after that. The 2009-2014 period saw the state’s population gains slow down by about 11,000 people a year. Illinois’ per capita national ranking also declined over the period. Ranked 27th-highest in the nation for population growth (per 1,000 residents) in 2001, Illinois’ ranking fell into the high 30s between 2002 and 2010. The tipping point for Illinois’ demographics was 2014, the first year the state’s population actually declined. Out-migration jumped and overwhelmed foreign immigration and the state’s natural increase. Illinois’ population fell by over 9,000 people, dropping Illinois to 46th-best nationally. 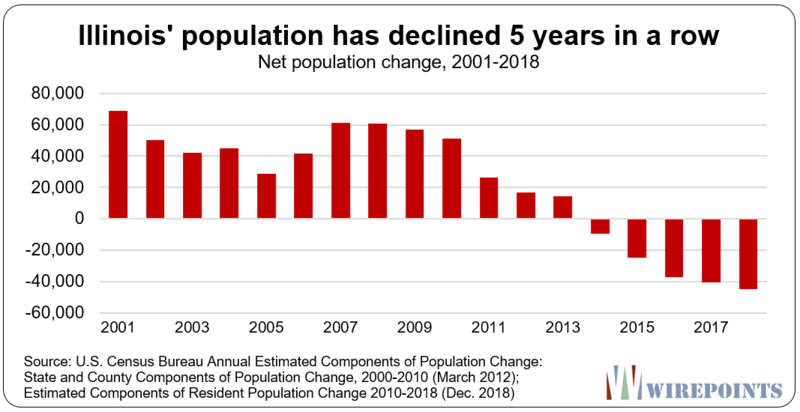 Illinois has lost population every year since, declining by a record 45,000 in 2018. In all, Illinois lost more than 157,000 people between 2014 and 2018, enough to empty out the entire city of Rockford (2017 population: 147,051) and then some. Illinois is an extreme outlier among states when it comes to population loss. It shares its 5-year decline with just two other states: West Virginia and Connecticut. In fact, Illinois was one of only three states to actually lose population in between the end of the Great Recession and 2018. Illinois’ population has fallen 0.8 percent since 2010, the 2nd-worst decline in the nation. Only West Virginia’s decline was worse at 2.6 percent. In contrast, Illinois’ neighbors all grew over the period. Iowa’s population is up 3.5 percent. Wisconsin and Missouri’s are up 2.2 percent. Even Michigan, which suffered the nation’s worst rate of domestic out-migration during the Great Recession, managed to grow its population by 1.2 percent. The difference in absolute numbers is stark. While most of the other big states in the nation have added thousands or millions of people since 2010, Illinois has lost them. Illinois’ population dropped by 100,000 while Pennsylvania eked out a gain of 95,000 people. Ohio added 150,000. Georgia added 808,000. California and Florida added more than 2 million people. And Texas added nearly 3.5 million people, the most in the nation. Some might argue that Illinois’ population problems are largely beyond its control, that it’s suffering from a decline felt by Rust Belt states and that cold weather is driving residents away. The data doesn’t bear that out. All of Illinois’ neighboring states – even the cold-weather ones – have grown their populations over the same period that Illinois shrunk. 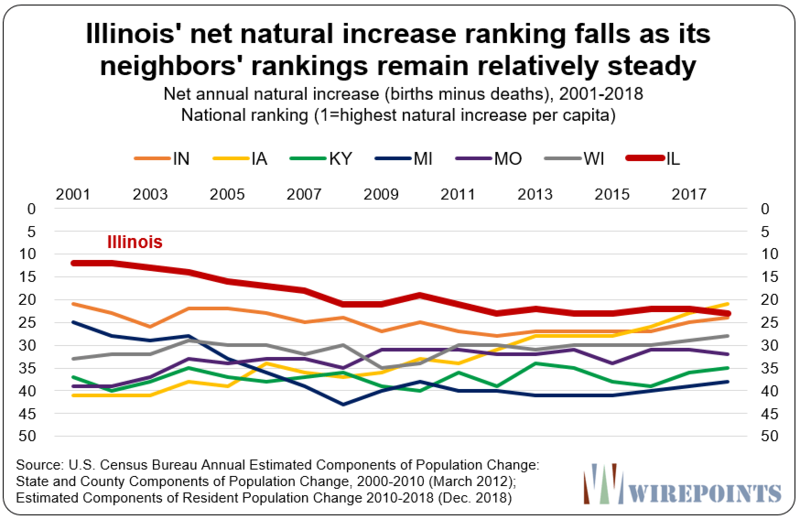 Just look at how Illinois and its neighbors’ compare in national per capita rankings. Illinois’ rank for domestic migration has been one of the worst in the nation for nearly two decades. The state’s neighbors, on the other hand, now all rank near the middle of the nation. They’re still losing residents to out-migration, but at a much lower rate than Illinois is. In terms of international migration per capita, Illinois used to be highly ranked compared to its neighbors. But immigration to Illinois has tanked over the years, more so than in other states. That’s caused Illinois’ ranking to steadily fall while many of its neighbors’ rankings, while volatile, are largely unchanged. The story is much the same for the natural increase per capita. Originally high at the turn of the century, Illinois’ ranking collapsed even as its neighbor’s rankings remained relatively steady. does anyone know why, the BIG WHY?, there is mass defection from Illinois? Yes. Everybody knows. Could it possibly be that only those few hundred in Springfield don’t know? Ok, springers, let me be the first to tell you: taxes. Corruption. AND those pensions that rob me while continuing to enrich the gub workers, highest per capita of any state both in pension amounts and number of gub workers, we will not continue to pay. One way or another, this state will be the first to collapse. Bring in the illegals-they will pay those pensions with their welfare monies. Ive lived in Illinois all of my life and Ive noticed a population decrease since High School. I graduated at McLeansboro High School in 86. My graduating class was around 115 to 125 students give or take. My daughter is graduating from the same school this year and graduating class of approximately 70 to 80 students. The states biggest problem especailly for the southern Illinois portion is CORRUPT CHICAGO politicains and Democrats taxing Illinois citizens out of the state. My family and I are planning to leave within 2 years to Missour because of tax hikes. We have had enough!!!! You need to go to the next level. Who and where people are leaving. Data points to African Americans are driving most of the out migration and it isn’t driven by taxes but lack of investment in communities, if their is investment it is genterification and crime. Chicago is losing people but becoming richer as poorer residents are moving out and richer ones are moving In. Maybe the best solution is changing zoning laws in Chicago to make housing cheaper. This should curtail younger generations from moving thus increasing the birth rate and lessing out migration. The thing that the report needs to go into is the financial aspect of those coming in, which should be available from IRS data. It’s not so much whether it’s blacks or whites leaving, but the income levels of those going and coming. The tax needs of various levels of government remain the same, so are the state and cities getting richer or poorer? I believe I saw somewhere that the income of people moving into Illinois is 14% less than those moving out. Someone has already done the calculation but I forget where I saw it. While the data supports African American population declining in Chicago it doesn’t support that being the driving force behind out migration nor does it support that this segment is poor. Chicago is hardly getting richer and in many ways in worse shape than the rest of Illinois. Thanks for the recommendation. We already have planned to follow up with the money flows associated with the outmigration. We’ll look at some demographics, too. I’m actually seriously considering converting to an interest_only mortgage. Why pay principle on a residence in Illinois, the future is indicating a glut of homes for sale someday. If one plans to eventually leave, then why pay principle, just use that extra cash each month. Or invest it for the move. Why pay principle on a declining home value? Love it, Rick. What we really need is a hedge on home values in Illinois – besides the obvious one which is to sell. The ability to short the North Shore real estate market for its residents would be an attractive product if the bid/offer were reasonable. Yes if the state is going to systematically confiscate home value to pay pensions. Why should I even try to increase my equity any more? At some point it makes more sense to put that home principle payment into something else as equity, maybe treasuries. Then move out at some point knowing that you did the best you could to preserve your monthly principle payments. The problem is an interest only mortgage has higher rates. Have to do the math against how long I’m gonna stay. Hey, why even pay all the interest? After all, Illinois isn’t doing that on its pensions. Mark: That’s GOOD ! Negative amortization — design the pymts to be less than interest on the loan for next 5 years and “promise” to jack up pymts after that so the house is 90% paid off in 2050….the govt pension contribution scheme! Yup. Too a very large extent, we’ve already been following the “just don’t fund the damn things” answer. Illinois is a recourse state. You’re still on the hook for the difference between the value of your home and the mortgage. So by not paying principal, you’re effectively going into more debt, i.e. more leverage on your Illinois real estate investment. If you can even call any Illinois real estate an investment anymore. Yeah, and that phat phallus in the Governor’s Mansion is going to fix everything by raising taxes. What a moron elected by some of the biggest morons in the nation. You reap what you sow. One way or the other, Illinois and Chicago are going BK. Illinois may get a Federal BK approval similar to Puerto Rico or die from a million lawsuits during the death spiral forcing some type of BK. Once Illinois goes BK, would it cease to be a State and then become a territory like Puerto Rico? IMO, if you go bust you should lose your Statehood. May loose its Statehood, but could get preferential tax treatment like Puerto Rico. With the population decline, Illinois will be losing electoral votes in 2020. They don’t even have that. The corrupt rating agencies will see to it that the ponzi continues on wolf investors loving those high yield Illinois bonds all constitutionally protected essentially. Its only going to get much worse. Its time to leave Illinois. No more making excuses. Yup. That’s what it comes down to. Mike, although 53% would like to leave, it takes time to turn thoughts into deeds. People need to sell homes and find new jobs/schools. If you owe more on your home than your equity, that’s a problem. If you have kids a year or two away from graduating, you may delay for their sake. If you have elderly parents or special need children, you have to plan carefully. I believe the 53% number is realistic. The exodus has already started and will continue to grow. The residents have lost hope. I know there are myriad reasons for remaining. But none for repeatedly re-electing incompetent pols. A head coach or manager of a pro sports team puts together a couple losing seasons and there are screams for his replacement. But an incompetent pol gets re-elected or re-appointed for decades. If those 53% are disenchanted many have to take a good look in the mirror. As an independent I never miss a chance to vote against them. Only the people who count the votes are saying who is elected – or re-elected. A practice that will be more starkly evident in the next four or five local election cycles. Be sure to remove your name from the rolls before leaving. In short, IL is a sinking ship because instead of leaving it the rats are steering it! We often talk about why people are leaving, but we don’t talk about why people stay. The main reason more people have not left is because picking up and moving away from your family and community is too hard a sell for most people, so they just grind it out. And the politicians know this, and are taking full advantage of it. Think about that. And I hope Ken Griffin reconsiders moving to NY (or any other state) — give Illinois leaders their David-Tepper moment. Fair point, calling it the “main reason” may have been a bit too flippant on my part. You are right about jobs, especially in the tech sector. But I did not know how bad the real estate issue was. Either way, I guess most people in the private sector probably don’t care where their tax dollars go — they just weigh the situation as money-in-money-out. My home is long since paid up but is only worth about what it cost over 35 years ago because the city, rather than maintain its older areas has chosen to expand into areas that were farmland. Now those who bought huge houses in the far areas want to be closer in, so we have gentrification of downtown with old warehouses being turned into “loft” apartments. We who live in the middle are like the states between the coasts. But we are just one smaller city. FYI: A study of negative equity by real estate site Zillow found 16.4 percent of Illinois homeowners with a mortgage owed that is more than their home was valued as of the end of 2017. Illinois liberals must love these trapped homeowners that just have to bend over and take it. But Pritzker said a tax increase will keep people like you from leaving because its financial stability for the state that everybody wants. My thanks to you and Ted for all the info you posted on this site.